Not all baked goods that come out of my kitchen are successes. But thats the great thing about baking, the majority of the mistakes are edible! I’m chalking this one up to my growling stomach and half-working brain (the lack of sleep that comes while adjusting to a new house, new noises, and new bugs). 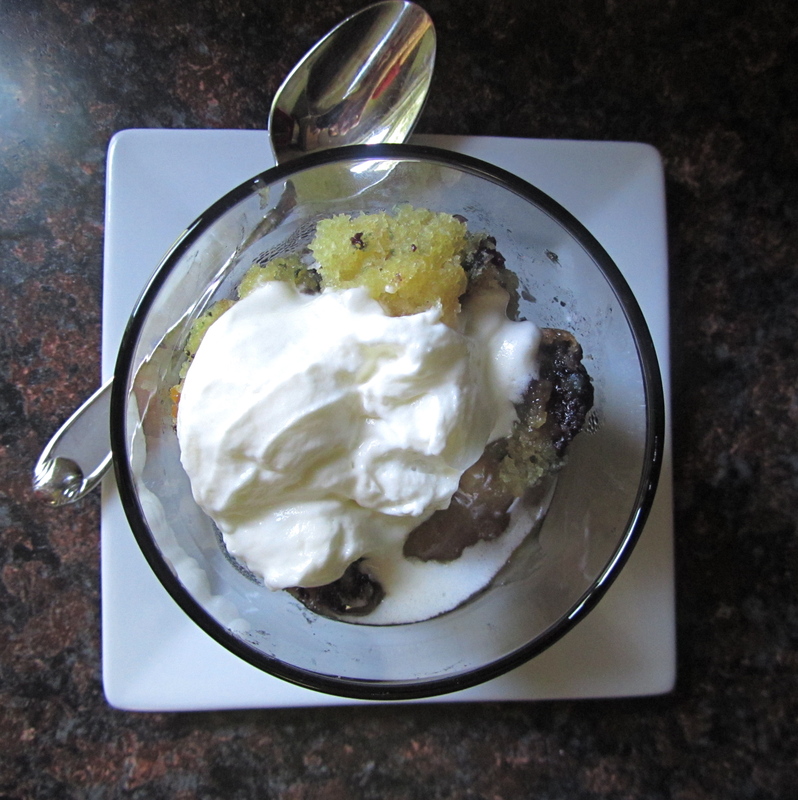 I really needed something sweet…I mean it it had been a solid 48 hours since I baked something. Unfortunately all that stared back at me from the near-empty fridge was half a container of blueberries, some plain yoghurt and 2 pitiful sticks of butter…salted butter. It’s OK I tell myself, I’ll just make some blueberry coffee cake. Well somewhere along the line of using a different size pan, substituting sour cream and buttermilk, and adding baking soda my cake overflowed. As in poured its beautiful golden batter all over my brand new oven. And then continued to cook…and cook…and cook…finally at an hour I declared it as done as it was going to get (I mean it swallowed the streusel topping whole!). it looked (and tasted) so promising! So I said to myself, “Self! If this is going to be a disaster, it’s at least going to be a calorie-filled, indulgent disaster!”. 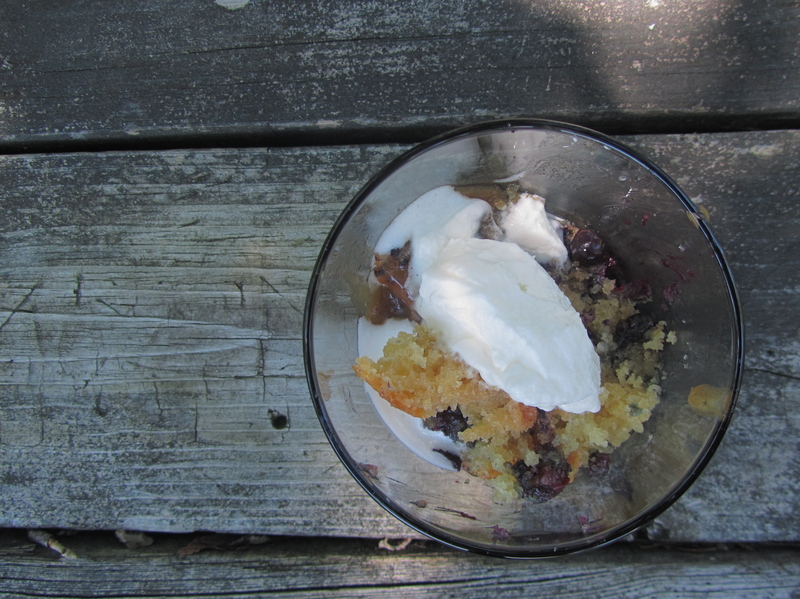 I crumbled the warm cake into some glasses, melted down the remaining streusel topping, and topped it all off with some unsweetened fresh whipped cream. You know, some disasters are just downright delicious. The cream melts into the cake a bit, the cake is moist and flavorful and bursting with blueberry goodness. 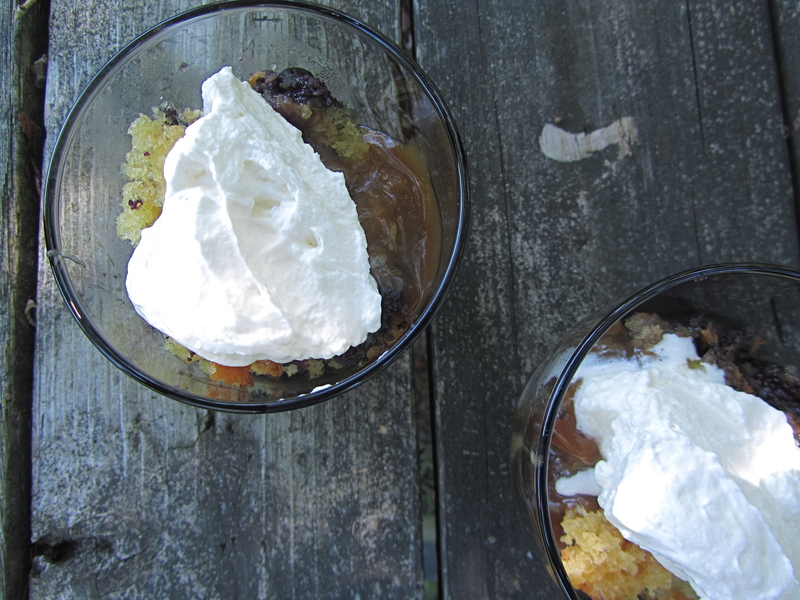 I’m sure the original coffee cake recipe is good though so I’ll post both for you…but even if you do get a perfect coffee cake, why not just crumble it and make some parfaits anyway? 1. Preheat oven to 350 degrees (F). 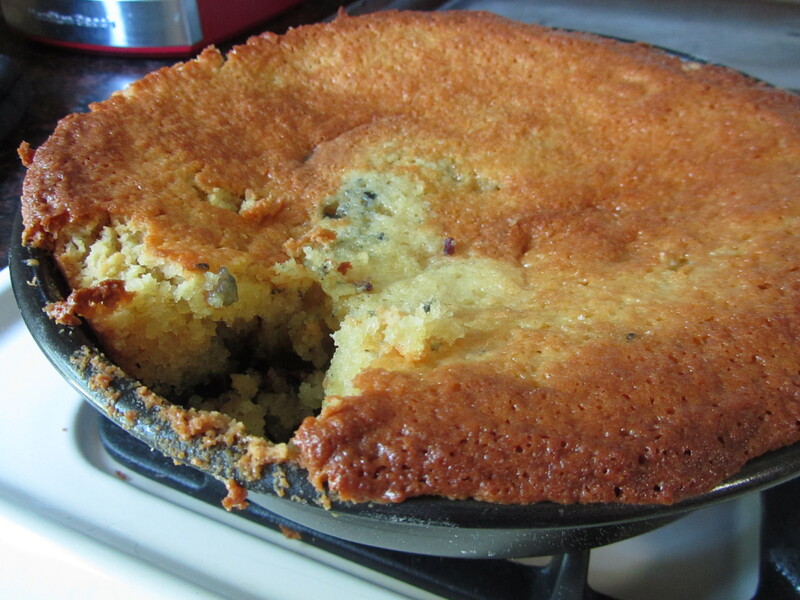 Grease a 9 inch square baking pan with butter or vegetable oil. 2. 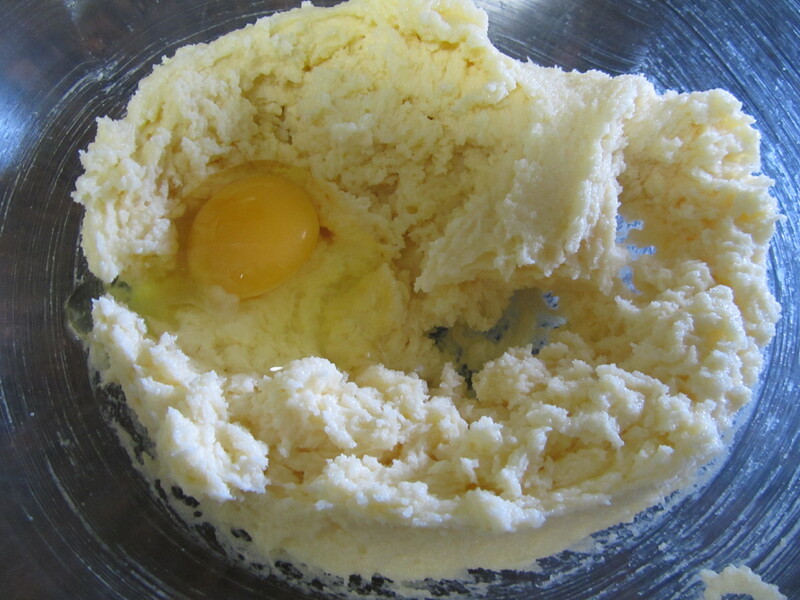 In a large mixing bowl, cream the butter, sugar and vanilla on medium speed until light and fluffy, about 2-3 minutes. Add the eggs one a time. 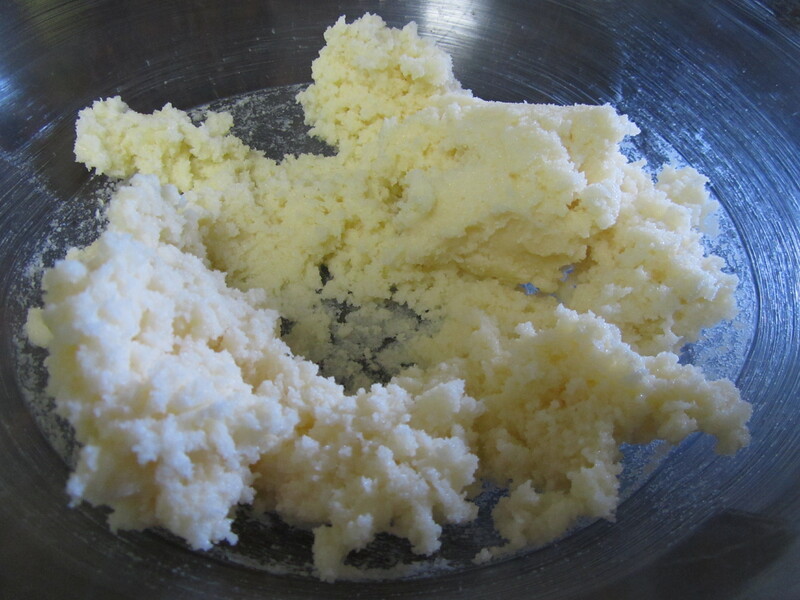 Add the dry ingredients in three parts alternating with the milk and beginning and ending with the dry ingredients. 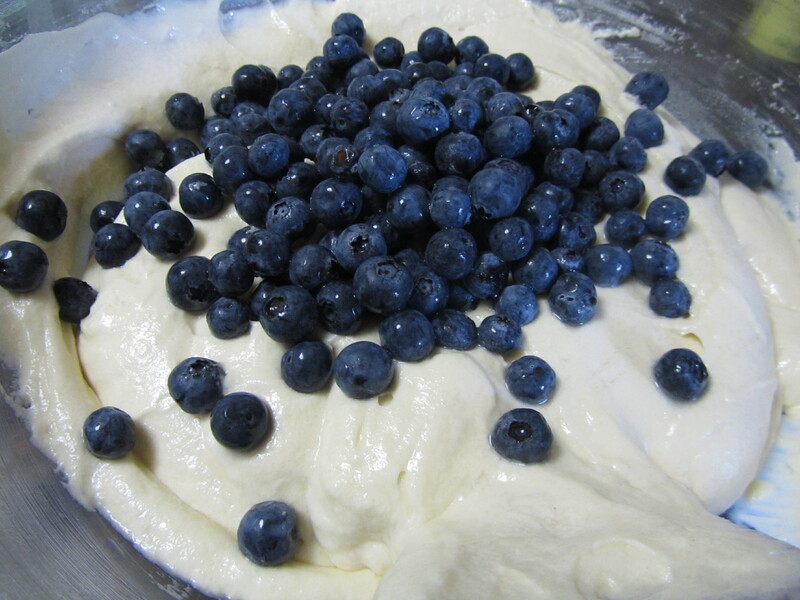 Fold in the blueberries gently. 3. Pour the batter into the prepared pan and bake on the center rack until the top is just set but not golden, 25-30 minutes. 4. While that is baking, prepare the streusel topping by placing the butter, flour, sugar, brown sugar and cinnamon in a small bowl and combining with a fork. 5. When the top of the cake is set, cover the surface with spoonfuls of topping and return the cake to the oven until the topping spreads and gets crunchy, 15-20 minutes. Remove from oven and serve hot. Warning: I used a pan size that was too small so I am guestimating here 🙂 Proceed with caution and put a baking sheet under the pan. 1. Preheat oven to 350 degrees (F). Grease a 11 x 7 inch baking pan with butter or vegetable oil. 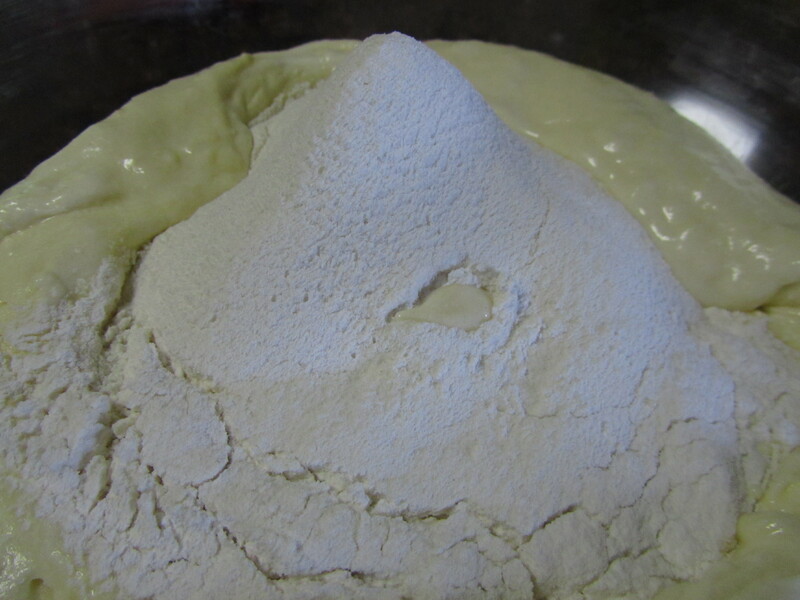 Sift the flour, baking powder, baking soda, and salt together into a small bowl. 2. 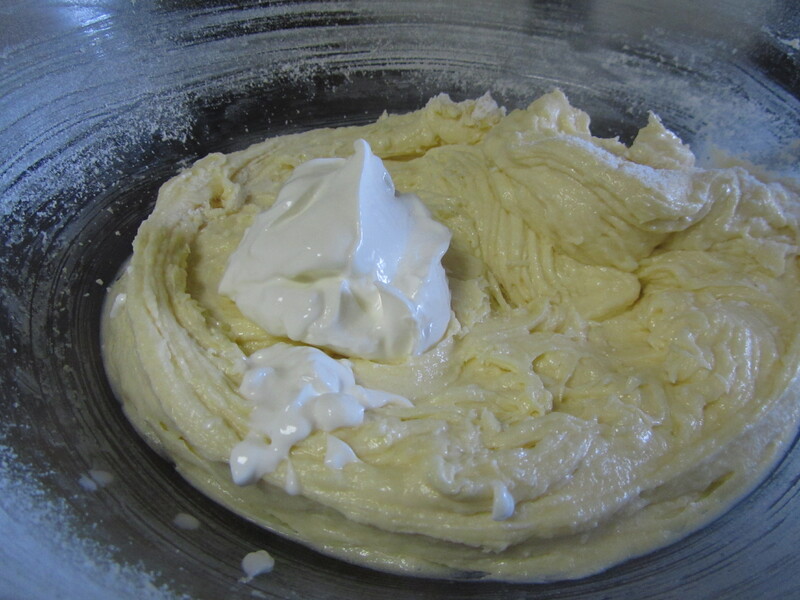 In a large mixing bowl, cream the butter, sugar and vanilla on medium speed until light and fluffy, about 2-3 minutes. Add the eggs one a time. Add the dry ingredients in three parts alternating with the sour cream and beginning and ending with the dry ingredients. 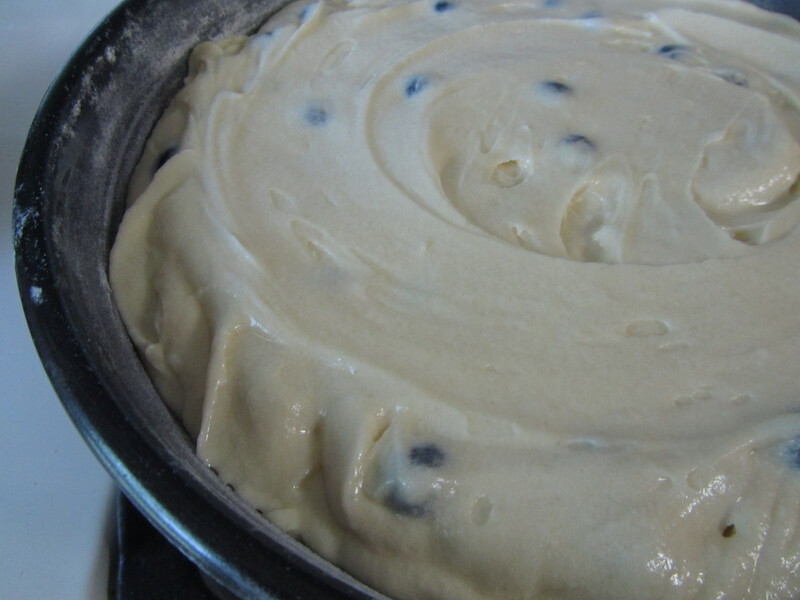 Fold in the blueberries gently. 3. Pour the batter into the prepared pan and bake on the center rack until the top is golden and a toothpick inserted in the middle comes out clean, 45-60 minutes. 5. When the cake is done, remove from oven and set aside on a wire rack. Place the streusel and 1 tablespoon of water in a small saucepan and bring to a boil. 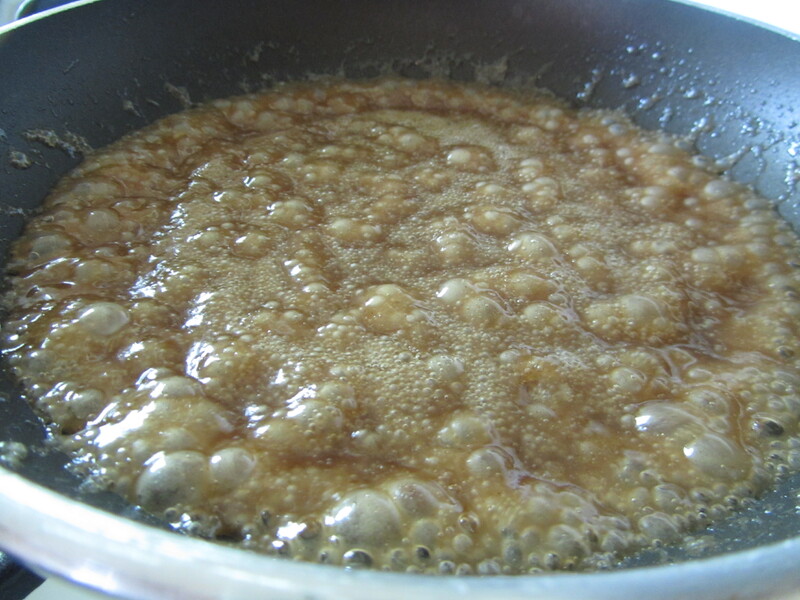 Boil for about a minute or until the sugar has completed dissolved. 6. To serve: Cut the cake in rough 1 inch chunks and distribute among 6 parfait, ice cream of medium drinking glasses. 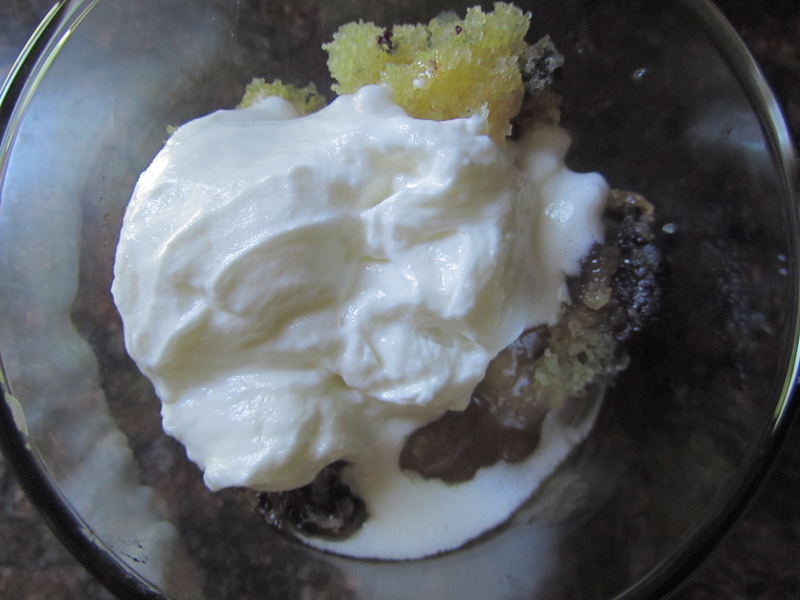 Spoon the melted streusel over top and dollop with a good amount of unsweetened fresh whipped cream. Serve immediately. your “mistake” looks absolutely delicious! and like my husband always says, as long as it’s edible, it’s perfect! thank you! I was surprised at how much I liked it! Sometimes it is by mistake that true success is achieved. It kind of forces you to be innovative with what you have. Simply delicious. Mistakes made in cooking can sometimes lead to the best foods… as is obviously the case here. 😀 Definite buzz!